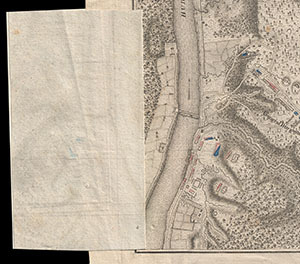 Map of the Battle of Saratoga with rare flap. Plan of the Encampment and Position of the Army under His Excelly. Lt. General Burgoyne at Braemus Heights on Hudson's River near Stillwater, on the 20th of Setpr, with the Position of the Detachment & c. in the Action of the 7th, of Octr, & Position of the Army on the 8th, Octr 1777. This is a scarce 1780 American Revolutionary War Map illustrating the Battle of Saratoga, a decisive engagement in the favor of the Colonial armies. Oriented to the south, this map covers an region roughly 9 miles south of Saratoga, New York. The map details lands from the Hudson River westward and from Stillwater northwards. 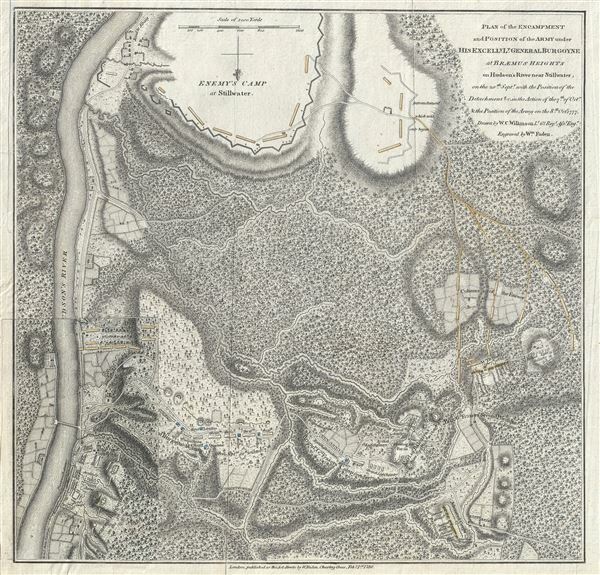 It illustrates the disposition of the two armies, with the British under General John Burgoyne at the bottom of the map and the American Colonial encampment at the top. The main body of the map illustrates the positions of Burgoyne's Army from September 20 to October 7. A flap affixed to the left side of the map reveals the army new position as of October 8. This flap is often lost and its presence here adds much to this military plan. Burgoyne defends his actions in the campaign that led to the disaster at Saratoga. He proves in this work that his army was half the size he had demanded, and was badly provided for. The work is one of the best sources on the campaign. William Cumberland Wilkinson (1756 - January 6, 1802) was an Irish officer in the British Army. He was born in Dublin to Reverend Thomas Wilkinson and Marguerite Susanne Maret de la Rive. Wilkinson was a talented officer that served as a Captain-Lieutenant and military engineer in the 62nd Foot Regiment under British General John Burgoyne during the American Revolutionary War. Wilkinson, like all of Burgoyne's officers surrendered at the Battle of Saratoga. He is best remembered in cartographic circles for completing a series of maps illustrating the disastrous Saratoga Campaign while in captivity. In 1780 Wilkinson was given a special disposition by his American captors to return to Ireland. He died in Belfast in January of 1802. Burgoyne, John, A State of the expedition from Canada : as laid before the House of commons… (London: J. Almon) 1780. Very good. Some wear along origial fold lines. Minor verso reinforcemnt to fold just to the left of imprint. OCLC 431559269. Streeter II:794. Nebenzahl, K., Bibliography of Printed Battle Plans of the American Revolution 1775 - 1795, #56.